Some 2018 improvements affect the 2019 budget because they must now be funded for a full year. These include the two-hour transfer, new express buses and other service changes. The continued Presto rollout brings added cost from administrative fees, but these have not yet been substantially offset by reductions in legacy TTC fare collection costs. The need for better fare enforcement brings a new cos in 2019 that was not factored into the original Presto project. Other factors contribute to rising overall costs. Although the diesel bus fleet has become more energy efficient with the retirement of older vehicles, the projected cost of fuel more than offsets this saving. The TTC proposes to offset the $96.4 million requirement in a variety of ways including reductions to current spending ($48.8m), a fare increase ($25.6m) and increased subsidy ($22m). This $96.4 million is considerably lower than the total “opening pressure” in the budget process when the initial version was created mid-way through 2018. Over half of this is offset by various projected changes. These cannot be called “savings” because some reflect budget adjustments based on actual 2018 experience, and some are one-time draws from City reserve funds. This table includes a few substantial reductions compared to the original budget. The largest is a reduction in benefit costs that began in 2018 with the effect of prosecutions for benefit fraud, and a further cost reduction against the original budget is expected in 2019. Although the original budget for benefits went up by $10.8 million, this is more than offset by a reduction of $16.6 million in the revised budget for a net cut of $5.8 million. This pattern is unlikely to continue into future years as the effect of more stringent benefit claims handling will have worked its way through the organization. Both traction power and diesel fuel are expected to come in well below the original budget figures based on actual 2018 experience, projections for 2019 and diesel fuel hedging contracts that have already locked in fuel costs for a about half of the 2019 requirement. An originally projected $22.5 million increase in diesel costs is reduced to $13 million in the revised budget. Two draws against reserves total $25.4 million. Although these are shown in the overall budget as “revenue”, they are another form of City subsidy. The Stabilization Reserve contains money from prior year underspending. A draw from this reserve has been included in recent TTC budgets, but because each year came in better than expected, the draw was not actually exercised. If this draw actually occurs in 2019, there will be no reserve left to fund an operating shortfall in 2020. The Accident Claims reserve is funded by the City with a fixed amount each year, and the TTC draws on it as needed to supplement its own provision for claims. The intent is to flatten out the effects of large claims on year-to-year funding needs. In 2019 the TTC proposes to take $10 million from this reserve because their draws on it have been lower than expected, and they would continue this in 2020 and 2021. This is, in effect, an addition to City subsidy via another route. Whether this source can be used indefinitely depends on TTC claims experience. On the revenue side, the TTC expects to receive about $6 million more in fare revenue (assuming no fare increase) because riders are paying a higher average fare. This is caused by more fares coming in at the single “token” rate via Presto rather than at the bulk discount of Metropasses. This will be offset by the cost of 70 new fare enforcement staff. Short-term revenues include leasing of the site of the future Kipling Yard to an existing occupant, but this is expected to end by 2021. Lane occupancy cost recovery refers to a proposal that the City bill projects that occupy road space for the cost of transit service adjustments. Whether this will actually happen remains to be seen, but in any event the amount is quite small in the 2019 budget. 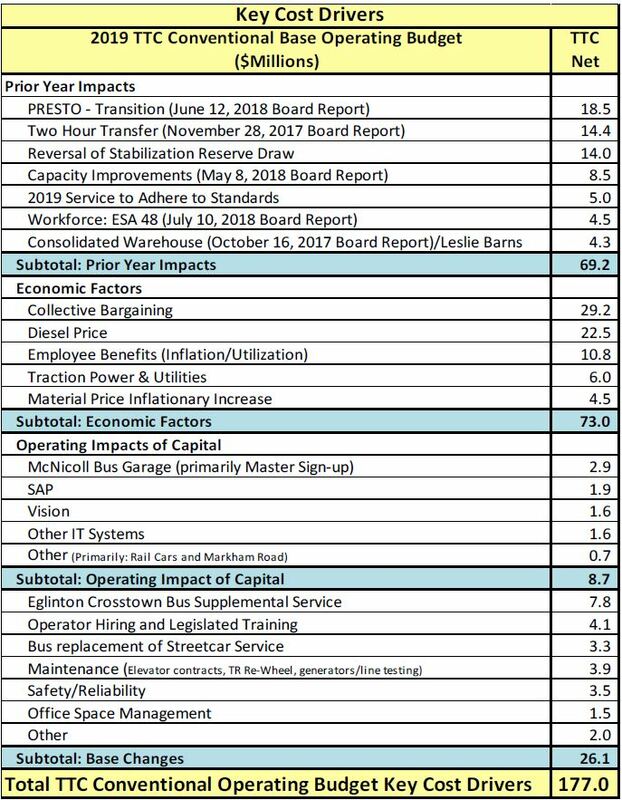 The Undetermined Corporate Reduction includes many hoped-for savings in various line items of which the largest is the recovery of $7.8 million in Crosstown related service costs. If Metrolinx does not pay this, then a substantial hole will exist in the TTC budget. In summary, the TTC is hoping that many possible cost adjustments will break in their favour. 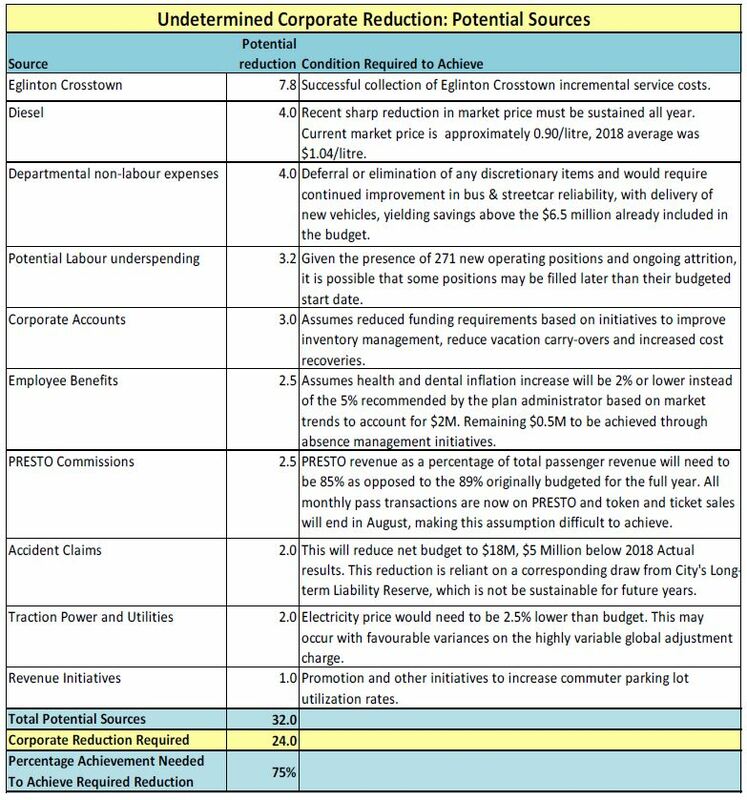 The table below is a scenario of how they might achieve an overall $24 million reduction. Note that it is not definitive, but is intended as an example of how this might be achieved. Appendix D of the budget discusses some of the risks inherent in achieving these savings. There is a common thread through much of the budgetary juggling. Many tactics used to hold down the size of the subsidy increase will be one-time changes that cannot be counted on in 2020, or even worse, are one-time revenue sources that will have to be replaced. 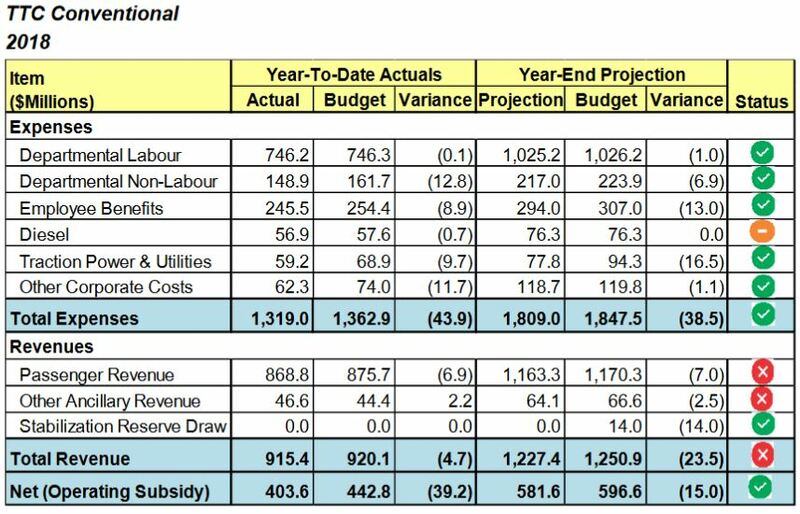 This kind of budgeting may get Council through another year, but there are only so many rabbits in the magician’s hat to solve TTC budget woes, or at least to distract the audience from understanding just how deep a problem the City will face. I have stared at that “Overcrowding” table for a few minutes, yet I cannot understand the data at all. Am I missing something? I clicked through to the CEO’s report but it did not have a better explanation. I am assuming this is supposed to be read like any other table should be, each mode has a row, and the columns are comparable selections data points. Or is that wrong? For example, it looks to me like in Q4 2018 six streetcar routes were overcrowded. Five of them were at peak periods, but… “20” were overcrowded at non-peak periods? 20 what? Vehicles? Routes? There aren’t that many routes. So it;s vehicles? But then only 5 vehicles are overcrowded on peak? I don’t get it. Steve: There are two peak periods (AM and PM), plus 13 off peak periods (weekday midday, early and late evening; Saturday and Sunday early and late morning, afternoon, early and late evening). 20 off-peak overcrowdings mean that there are 20 combinations of a route and a time period that are overcrowded. The City of Toronto is reaching a crisis tipping point. Like an ostrich with it’s head in the sand, the politicians do not want to see the writing on the wall. years of underfunding and parsimony are coming home to roost. The TTC needs to stop the wishful thinking and budget on realities. 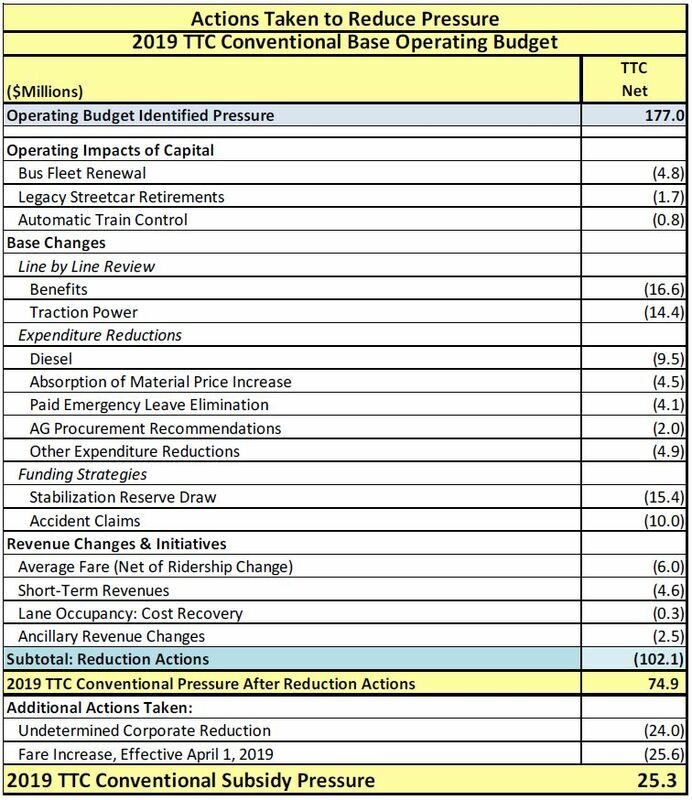 “The Undetermined Corporate Reduction includes many hoped-for savings in various line items” is a list of hoped for savings and at the bottom of the chart they note they need a 75% success rate to meet their goal. This parsimony is a deliberate result of years of budgetary restraint. The days of Mike “the knife” are long past. The politicians are all crowing about “getting to the bottom” of the current poor levels of TTC service. Citizens of this city are tired of the neglect of the TTC. We want a better way. And that means funding. Property taxes in the city of Toronto are lower than any surrounding Municipality. Zero increases are not a savings, just a way to put off the pain until later. Cost of living increases are a way to maintain the status quo. If a 1 or 2% increase is required for a stable TTC, vote it and tie that revenue directly to the TTC as firm committed funding. Show the public where the funds are going. The only way forward to a long term successful transit system is to budget for worst case scenarios and fund accordingly. Budget overages should go to the stabilization reserve, which would need to be capped at a predetermined point, and excess monies used to pay down city debt early. Next the budget must be revised and simplified at board level to show to main sections, a base budget and a growth portion. The base budget will allow for the proper maintenance and service of the existing system at current operating levels – no improvements, just the same level of service as the prior year, and the costs to maintain the system at that level. The growth portion of the budget is more complex. It needs to show two costs for every line item proposed. The cost of the implementation of the improvements, and the cost of operating the improvements per year. The list obviously would need to be prioritized so a yard would be ready to go before a new fleet was ordered etc. This budget style would cause some minor pain to implement, but offer long term benefits. The current asset the city has is protected from deterioration by proper funding and the base system is funded to operate properly and safely. Excess funding is channelled back to the city through the cap on the stabilization reserve. It would make unfunded items (below the line) easy to see. Steps to improve service are clearly set out, and both the capital and operating cost are spelled out, making clear the choices for both members of the public to advocate for and the members of the board to choose. Perhaps this is idealistic and simple, but it would clearly set out next steps. The other issue to look at is subsidy funding. The TTC receives the smallest per rider subsidy of all Ontario systems and most North American systems too. Both the province and the federal government need to step up and redress the balance. Cleaning up the subsidy issue is the first step towards fare parity. Metrolinx is imposing financial penalties on Bombardier after is missed last Friday’s deadline to deliver 6 LRT vehicles. It is time for TTC to follow suit. And no, we don’t want compensation cars that will be defective and will require to be recalled. Also, compensation cars will arrive years late and then, we will need compensation on compensation. For these reasons, TTC should accept nothing but cash compensation from Bombardier. Steve: TTC has been working on this for some time. One issue is the question of what constitutes “liquidated damages”, that is to say the added costs borne by the TTC because the cars are late. Remember how they spent millions rebuilding ALRVs only to discover that they still didn’t work. The ball is not entirely in Bombardier’s court. Also, while that company is far from favoured these days, you cannot assume that any compensation by way of extra cars would involve recalls, and the TTC badly needs as many more cars as they can get.